History: was formed during 1996 by Georges Bertrand, owner of Publi-Air and aerodrome Temploux, and Vlaamse Helicopter Maatschappij (VMH). A DC3 was leased for making nostalgic flights from various Belgian airports. The airframe arrived at Brussels on March 27 1996 and was painted in old Belgian Air Force markings with a fake registration OT-CWG to celebrate their 50 years anniversary. However the nostalgic flights never materialized because the Belgian Civil Aviation Authority refused giving a license to operate passengers flights. The main reason for refusal was that the airframe was a converted ex-military machine. 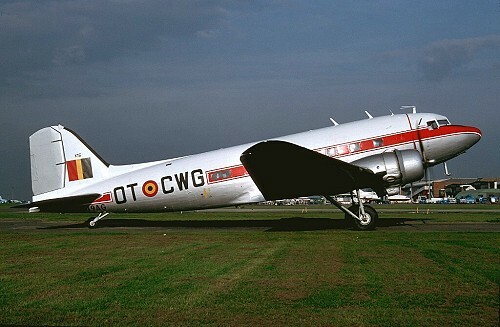 Besides a few (static) appearances at air shows, it remained stored at Brussels until ferried to France on March 23 2002, closing the doors at Air Dakota.